In addition to correcting the physical problems resolved by the database recover process, the rebuild process updates user and object information in a domain database (wpdomain.db) or post office database (wphost.db). However, the process requires that no users or GroupWise agents (MTA or POA) have access to the database during the rebuild process. You receive an administrative message informing you that an internal database error has occurred or there is database damage and you think there might be data loss. When you rebuild a secondary domain database, information is retrieved from the primary domain. When you rebuild a post office database, information is retrieved from the domain it belongs to. All GroupWise agents that might access the database must be stopped during the rebuild, as described in Stopping the MTA and Stopping the POA. 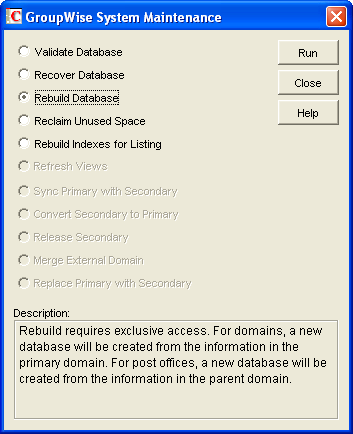 If you are rebuilding a post office database, all users should exit and you should disable the post office before the rebuild, as described in Section 12.9, Disabling a Post Office. Make sure you have sufficient disk space for the copy of the database that is created during the rebuild process. In ConsoleOne, browse to and select the Domain object or Post Office object where you want to rebuild the database. Click Rebuild Database > Run. When prompted, make sure the Path to Database is correct. If an incorrect path is displayed, browse to and select the path to the database being rebuilt. Click OK.